NETWORK FINALS: Once the CBS numbers were scrubbed of their NFL overrun, 60 MINUTES dropped half a point to 2.6, NCIS: LA and ELEMENTARY each shed 0.1, and MADAM SECRETARY remained unchanged. 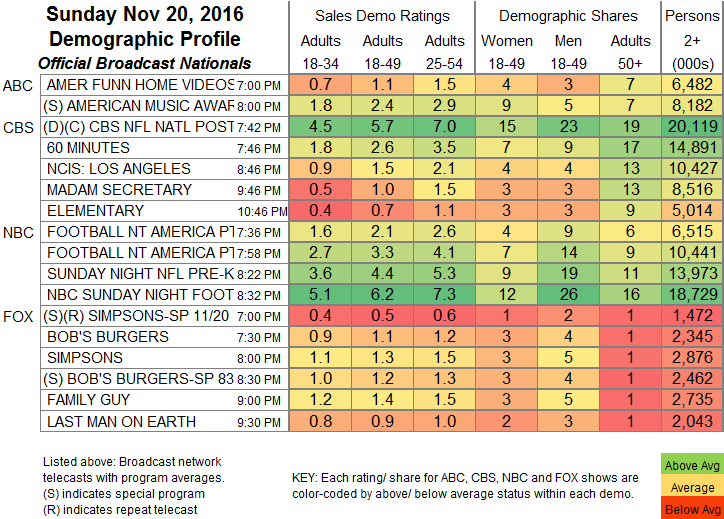 SUNDAY NIGHT FOOTBALL itself adjusted to 6.2 for NBC, although that was down a big 1.5 from the previous week’s final number. In addition, both the 7:30PM BOB’S BURGERS and FAMILY GUY gained 0.1. CABLE HIGHLIGHTS; AMC’s THE WALKING DEAD remained gargantuan but steadily diminishing, down 0.26 from last week to 5.17, with TALKING DEAD down 0.02 to 1.69, and COMIC BOOK MEN up 0.05 to 0.38. Hallmark’s holiday movie franchise continues to be an event for many viewers, as A DECEMBER BRIDE scored at 0.83. That was higher than HBO’s WESTWORLD, itself up 0.02 to 0.80, with DIVORCE up 0.02 to 0.18, and INSECURE down a tick to 0.16. Disney’s ELENA OF AVALOR was strong at 0.60. TNT’s THE LIBRARIANS returned at 0.53, midway between the 0.63/0.44 for last year’s 2-hour season premiere. On Showtime, SHAMELESS ticked up to 0.49, and the season premiere of THE AFFAIR was a hundredth below the 2015 premiere at 0.17. On Adult Swim, YOUR PRETTY FACE partly rebounded from last week’s steep drop, up a tenth to 0.47, while DREAM CORP LLC was up 0.09 to 0.41, and SQUIDBILLIES returned at 0.38. USA’s EYEWITNESS ticked up to 0.16. On Starz, ASH VS EVIL DEAD fell 0.06 to 0.12, and BLUNT TALK dropped off the Top 150 chart, down 0.03 to 0.04/107K. Unscripted programming was led by Bravo’s REAL HOUSEWIVES OF ATLANTA, down 0.06 to 1.03, with MARRIED TO MEDICINE down 0.08 to 0.57. 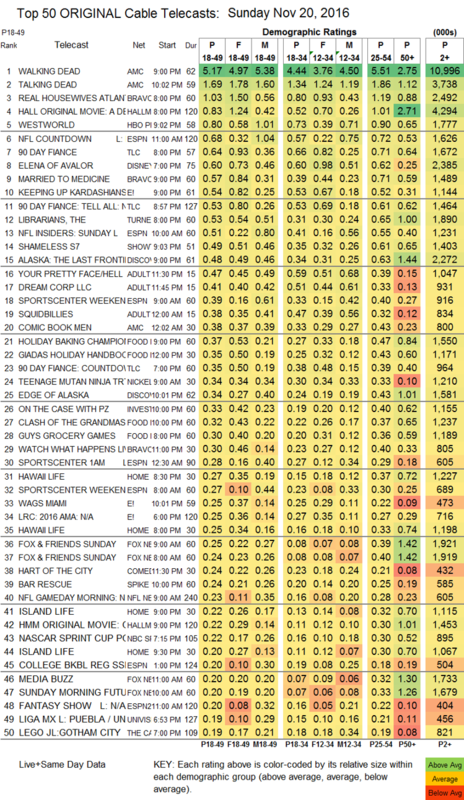 TLC aired 2 hours of 90 DAY FIANCE programming at 0.64/0.53, compared to last week’s 3 hours at 0.64/0.63/0.55. On E!, KEEPING UP WITH THE KARDASHIANS slipped 0.02 to 0.54, and WAGS ticked up to 0.25. On Discovery, ALASKA: THE LAST FRONTIER lost 0.03 to 0.48, and EDGE OF ALASKA was up 0.04 to 0.34. On Food Network, HOLIDAY BAKING CHAMPIONSHIP fell 0.13 to 0.37, CLASH OF THE GRANDMAS dropped 0.06 to 0.32, and GUY’S GROCERY GAMES was down 0.08 to 0.30. Spike’s BAR RESCUE shed a tick to 0.24.